Contemporary discussions about the Prophet Muḥammad’s spiritual function, due to exoteric and literalist influences (such as Wahhabism or the Ahl al-Qur’ān school), have degenerated into a farce in which the Prophet is demoted to a mouthpiece or transmitter of the Qur’ān and nothing more. This conception reduces the august person of the Prophet Muḥammad to a ‘fax-machine’ and fails to appreciate the spiritual depth of his status as Rasūl Allāh (Messenger of God). This important article, published on the Milād al-Nabī – the birthday of the Prophet Muḥammad first commemorated by his spiritual heirs and progeny known as the Fatimid Imām-Caliphs) – seeks to unveil the metaphysical, spiritual, and religious status of the Prophet Muḥammad – based on a simple and straightforward analysis of the verses of the Holy Qur’ān. The article is divided into two sections – the Prophet-Believer Relationship and the God-Prophet Relationship. It will be shown that the Prophet Muḥammad is the “Messenger” (rasūl) of God who reveals not only the Qur’ān but God’s very “Personality” – His Names, Attributes and Qualities – to the Believers. 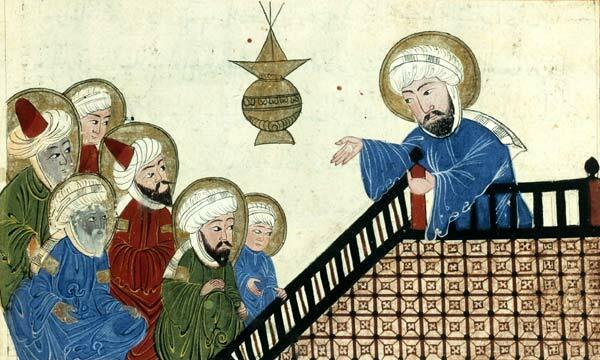 This article assumes that Muhammad is a true Prophet and that the Qur’an is divinely-revealed – see our article Proof of Prophecy for the logical and historical evidence for Muhammad’s prophethood. For Muslims, the findings of this article raise certain imperatives in belief and practice – since the Qur’ān is God’s revelation and its verses present a most exalted image of the Prophet Muḥammad whose presence must form the center of Muslim spiritual life. For academics and historians, this study reveals how the Qur’ān – the earliest piece of documentary evidence on the life of the Prophet – depicts how Muḥammad considered his spiritual status before God and his spiritual authority in relation to his followers. In both cases, it is clear that the original impulse of the faith that became known as Islam revolved around the person of the Prophet Muḥammad and not scripture, ḥadīth, law or scholars (‘ulamā’). Today’s Shī‘ī Ismā‘īlī Muslims are often unfairly criticized for the respect, reverence, and love they show towards their present Imām – Mawlānā Shāh Karīm al-Ḥusaynī Āgā Khān – based on the dubious and superficial notion that nothing should be accorded any reverence except God. However, if the Imām is the spiritual, religious and blood successor of the Prophet Muḥammad, then the Imāms would logically continue to perform all of the prophetic functions aside from the revelation of the Qur’ān. Accordingly if one accepts the principle of the Shī‘ī Imāmah, all the reverence due to the Prophet would be directed to the Imāms who are his spiritual heirs. Thus, it should be no surprise that the numerous spiritual responsibilities that the Qur’ān vests in the Prophet Muḥammad continue to be performed today by Imām Shāh Karim Āgā Khān IV – including the functions of guidance, guardianship, mercy, forgiveness, pardon, intercession, blessings, and purification. All of these various functions are attested to by Qur’anic verses quoted in this post. We encourage readers to scan through this post to get a better sense of the arguments and note the key Qur’ānic verses about Muḥammad’s spiritual status. Even as We have sent among you a Messenger from you, reciting to you Our Signs, and purifying you (yuzakkīkum), and teaching you (yu‘allimukum) the Book (al-kitāb) and Wisdom (al-ḥikmah), and teaching you that which you do not know. The above verse shows how the mission of Muḥammad includes much more than revealing the Qur’ān. In fact, only Muḥammad’s first duty – “reciting to you our Signs (ayāt)” – refers to the Qur’ān. The other duties of the Prophet included purification (tazkiyyah), teaching (ta‘līm) of the Book, teaching the inner Wisdom of the Book, and teaching the Believers new knowledge. Thus, the revelation of the Qur’ān comprises only one fourth of the Prophet’s overall mission. And verily you [Muḥammmad] surely guide to the Straight Path (ṣiraṭ al-mustaqīm). All Muslims pray for God to guide them to the Straight Path in every prayer. But the above verse, revealed to the Prophet, clearly shows that it is actually Muḥammad’s duty to “guide to the Straight Path”. And We have sent down unto you (also) the Reminder; that you may explain clearly (li-tubayyina) to mankind what was sent down for them, and that they reflect . The above verse demonstrates how the Prophet – in addition to revealing the Qur’ān – must also provide the “explanation” (bayān) of the Qur’ān to the believers to foster their own reflections (fikr). We sent a Messenger only to be obeyed by the permission of God. Verily, those who give their bay‘ah to you, they surely give their bay‘ah to God Himself. The above verses show that obedience to the Prophet Muḥammad is equal and tantamount to obedience to God. It logically follows that all orders in the Qur’ān to “obey God” are only fulfilled by obeying the Prophet Muḥammad. So whatever the Messenger gives you, take it. And whatever he forbids you, abstain from it. The above verse indicates that it is indeed the Prophet Muḥammad who determines what is allowed and what is forbidden. Whatever the Prophet gives to the Believers – guidance, prescribed rituals, rules of behavior – must be followed. The Prophet has more authority (awla) over the believers than their own souls. Verily, your Lord-Guardian (walī) is only God, His Messenger, and those who have faith, who establish regular prayers, and give the zakah while they bow down. But no, by the Lord, they do not have faith, until they make you [Muḥammad] judge in all disputes between them, and find in their souls no resistance against your decrees, but they submit (to you) in full submission. Verily, We have sent down to you the Book with the Truth so that you judge between the people by what God as shown you. The answer of the Believers, when summoned to God and His Messenger, in order that he may judge between them, is no other than this: they say, “We hear and we obey”: it is such as these that will attain felicity. It is not fitting for a Believer, man or woman, when a matter has been decided by God and His Messenger to have any option about their decision: if any one disobeys God and His Messenger, he is indeed on a clearly wrong Path. The above verses all describe the proper situation of the Believer in relation to the Prophet Muḥammad. Indeed, the very condition of having “faith” (īmān) is to wholeheartedly accept and submit to the judgment, decrees, and orders of the Prophet Muḥammad without any question. In order that you have faith in God and His Messenger, that ye may assist him and honour him, and praise Him morning and evening. Those who follow the Messenger, the ummī Prophet, whom they will find described in the Torah and the Gospel (which are) with them. He will enjoin on them that which is right and forbid them that which is wrong. He will make lawful for them all good things and prohibit for them only the foul; and he will relieve them of their burden and the fetters that they used to wear. Then those who have faith in him, and honour him, and help him, and follow the light which is sent down with him: they are the successful. O you who have faith! Do not be forward in the presence of God and His Messenger; but fear God: for God is He Who hears and knows all things. O ye who believe! Raise not your voices above the voice of the Prophet, nor speak aloud to him in talk, as you may speak aloud to one another, lest your deeds become vain and you perceive not. Those that lower their voices in the presence of God’s Messenger,- their hearts has Allah tested for piety: for them is Forgiveness and a great Reward. God’s love and forgiveness reach the Believers only through their obedience to the Prophet Muḥammad. This shows how Muḥammad, in fact, serves as the “gate” and “channel” of God’s love and forgiveness. And obey God and the Messenger; that ye may obtain mercy. And we have only sent you [Muḥammad] as a Mercy to the worlds. It is by the Mercy from God that you (O Muhammad) were gentle with them, for if you had been stern of heart they would have dispersed from around you. This verse establishes how the Prophet Muḥammad’s gentle qualities toward the Believers are actually expressions of the Mercy of God. This suggests that the Prophet’s mercy is the manifestation of God’s mercy. There has certainly come to you a Messenger from among yourselves. Grievous to him is what you suffer; [he is] concerned over you and to the believers is kind (ra’ūf) and merciful (raḥīm). But Allah would not punish them while you, [O Muhammad], are among them, and God would not punish them while they seek forgiveness. And if, when they wronged their souls, they had come to you, [O Muḥammad], and asked forgiveness of God and the Messenger had asked forgiveness for them, they would have found God Forgiving and Merciful. The above verse shows that a) when the Believers seek the forgiveness of God they must go into the physical presence of Muḥammad; b) Muḥammad must pray to God and seek God’s forgiveness for the Believers; and c) only after Muḥammad’s prayer for God’s forgiveness will the Believers have “found God Forgiving and Merciful”. This shows how the Prophet Muḥammad serves as the intercessor and mediator between God and the Believers with respect to God’s forgiveness and mercy. And when it is said to them, “Come, the Messenger of Allah will ask forgiveness for you,” they turn their heads aside and you see them evading while they are arrogant. Despite the Qur’ānic promise of the Prophet Muḥammad’s intercession and prayers, some people – even some Muslims today – are too arrogant to accept the reality and need for the Prophet’s special intercessory prayers. It is by the Mercy from God that you (O Muhammad) were gentle with them, for if you had been stern of heart they would have dispersed from around you. So pardon (‘afu ‘anhum) them and ask forgiveness (astaghfir lahum) for them and consult with them upon the conduct of affairs. And when you are resolved, then put your trust in God. Lo! God loveth those who put their trust (in Him). Hold to forgiveness (al-‘afū); command what is right; But turn away from the ignorant. The above verses also confirm how the Prophet Muḥammad has been commanded to pray to God on behalf of the Believers who are seeking God’s forgiveness. However, these verses also command the Prophet to perform another act of forgiveness or pardoning (indicated by the Arabic word ‘afwa – related to the Urdu word ma‘af). Therefore, the Prophet Muḥammad both a) seeks God’s forgiveness for the Believers as an intercessor and b) pardons the Believers by his own act of forgiveness (see also 5:13). Both forms of prophetic forgiveness are necessary. O ye who have faith! When you privately consult the Messenger, then present an offering (ṣadaqah) before your private consultation. That will be best for you, and purer for you. But if you find not (the means), God is Oft-Forgiving, Most Merciful. This verse establishes how the Believers would seek to have private meetings (najwā) with the Prophet Muḥammad. The Qur’ān recommends that every Believer submit an offering (ṣadaqah) to the Prophet Muḥammad when having this special meeting – and that this offering is a means of purity (tahārah) for the Believers. And among the Arabs are those who have faith in God and the Last Day and take what they spend as a means of closeness toward God and the prayers/blessings (ṣalawāt) of the Messenger. Behold, it is indeed a means of closeness for them. God will make them enter in His Mercy. Indeed, God is Most Forgiving, Most Merciful. The above verse significantly confirms that some of the Arabs would give a portion of their wealth to the Prophet Muḥammad – as a means of attaining the Prophet’s prayers or blessings (ṣalawāt) and closeness to God. The verse encourages this practice of submitting offerings and states that as a result of spending one’s wealth, such people will be made to enter into God’s Mercy. And (there are) others who have acknowledged their faults. They mixed a righteous action with another that was bad. It may be that Allah will relent toward them. Lo! Allah is Forgiving, Merciful. Take offerings (ṣadaqah) from their wealth, and purify and sanctify them by means of it. And pray/send blessings over them. Verily, your prayer/blessing is a source of peace (sakan) for them. And God is the Hearing, the Knowing. The next verses continue and describe those Believers who have performed good deeds, but also committed sins while acknowledging their faults. The Qur’ān orders such people – who have committed any kind of wrong-doing – to give an offering (ṣadaqah) from their wealth (amwāl) to the Prophet Muḥammad. The Prophet is then ordered to accept these offerings (ṣadaqah) and thereby purify and sanctify the Believers. The Prophet Muḥammad is also told to give his special prayers or blessings upon the Believers – and that the special prayer of the Prophet is a source of peace (sakan) for them. This verse clearly indicates that it was the prophetic practice of Muḥammad to accept material offerings from the Believers and purify, sanctify, and pray/bless those who submitted such offerings. O People of the Book! Now hath Our Messenger come unto you, clarifying for you much of what you used to hide of the Book, and forgiving much. Now there has come unto you a Light (nūr) from God and a manifest Book. O Prophet! Lo! We have sent thee as a witness and a bringer of good tidings and a warner and a summoner unto God by His permission and as a lamp that gives light (sirāj munīran). Those who disbelieve among the People of the Book and among the Polytheists, were not going to depart (from their ways) until there should come to them the Clear Proof (al-bayyinah) – a Messenger from God reciting purified pages. You [Muḥammad] are not, by the Favour of your Lord, possessed (majnūn). Verily, for you is an unfailing reward. And you are surely upon exalted character (khulq ‘aẓīm). This verse refers to the Prophet’s character or inner constitution (khulq) as “sublime” (‘aẓīm). This is significant because the Qur’ān also refers to itself as “sublime” (‘aẓīm) and often mentions God as “the Sublime One” (al-‘aẓīm). So how [will it be] when We bring from every people (ummah) a witness (shahīd) and We bring you [O’ Muḥammad] against these [people] as a witness? This verse is one of the most mysterious in the entire Qur’ān. It indicates that on the Day of Judgment, the Prophet Muḥammad will be a witness over all of the witnesses of each nation or people. The Prophet’s role as universal witness suggests that he must remain spiritually present in the world at all times – in order to actually serve as a witness over the deeds of all human beings. And if it was not for the Grace of God upon you [O Muḥammad], and His Mercy, a group of them would have determined to mislead you. But they do not mislead except themselves, and they will not harm you at all. And God has revealed to you the Book and Wisdom and has taught you that which you did not know. And ever has the Grace of God upon you been great. Your companion/master (ṣāḥib) is not astray or deceived. He does not speak out of caprice/desire (al-hawā). It is no less than inspired inspiration (waḥyun yūḥa). The Trustworthy Spirit (rūḥ al-amīn) descended with it [the revelation] upon your heart (qalbika) so that you would be among the warners in clear Arabic language. And that We have inspired you [Muhammad] with a Spirit (rūḥ) from Our Command. You did not know what was the Book (kitāb) and what was the Faith. But We have made it a Light (nūr) by which We guide those of our Servants as We will. And verily, you guide to a Straight Path. These verses illustrate the nature of the divine inspiration (wahy; ta’yīd) which God has granted to the Prophet Muḥammad. Firstly, this inspiration is spiritual in nature and flows through Holy Spirit that comes from God’s Command. Secondly, the inspiration comes upon the Prophet through his heart – the spiritual faculty of the human soul – and not in the form of sounds, words, or letters. Thus, divine inspiration is not a form of verbal dictation – such an idea is a complete insult to the spiritual depth of the Prophet Muḥammad. Thirdly, the verses show how whatever Muḥammad says, does, or thinks is divinely-inspired – not only the revealed Qur’ān – but all of Muḥammad’s speech and guidance is guided by God and not from human whims or desires. This prophetic inspiration is continuous and not discrete – it does not cease or stop at one moment and resume at another – but continues like a stream. Finally, it is this inspiration or divine assistance granted to the Prophet Muḥammad that allows him to perform all of the above prophetic functions. The very soul of the Prophet Muḥammad is continuously inspired and guided through the Holy Spirit – this is what makes him more than an ordinary human being. From this we could even conclude that the Qur’ān and the very personality of the Prophet Muḥammad are manifestations of the same Holy Spirit that flows from the Command of God. The Prophet Muḥammad summons the Believers to that which gives them life (8:24). The Prophet Muḥammad recites the Signs of God (2:151). When one examines the above verses in closer detail, it will become apparent that a number of the qualities, attributes, and functions that the Qur’ān gives to the Prophet Muḥammad are rooted in or identical to the Most Beautiful Names of God. Their guidance is not your responsibility [O’ Muḥammad], but God guides whom He wills. And that We have inspired you [Muhammad] with a Spirit from Our Command. You did not know what was the Book (kitāb) and what was the Faith. But We have made it a Light (nūr) by which We guide those of our Servants as We will. And verily, you guide to a Straight Path. When both verses are taken in context, the only conclusion is that Muḥammad himself is guided by God directly through the Holy Spirit and that he in turn guides the Believers on God’s behalf. Therefore, God effectively guides people through the guidance of Muḥammad. Accordingly, Muḥammad’s guidance is the manifestation of God’s guidance and Muḥammad’s role as “the guide” (al-ḥādī) to the Straight Path is the reflection on earth of God’s Name al-Ḥādī. And (there are) others who have acknowledged their faults. They mixed a righteous action with another that was bad. It may be that Allah will relent toward them. Lo! Allah is Forgiving, Merciful. Take (khud) offerings (ṣadaqah) from their wealth (amwālihum), and purify and sanctify them by means of it. And pray/send blessings over them. Verily, your prayer/blessing is a source of peace (sakan) for them. And God is the Hearing, the Knowing. Do they not know that it is God who accepts repentance from His servants and takes the offerings (ya’khudu al-ṣadaqāt) and that it is God who is the Accepting of repentance, the Merciful? In the above verse, the Prophet Muḥammad is ordered to “Take (khud) offerings (ṣadaqah) from their wealth (amwālihum)”. But the next verse confirms that it is God who “takes the offerings (ya’khudu al-ṣadaqāt)”. Similarly, the Prophet Mūhammad is told to purify them (tuṭahhiruhum) and sanctify them (tuzakkiruhum) by means of this offering. Yet the Qur’ān also says that “God purifies (yuzakkī) whom He wills” (Qur’ān 24:21, see also 33:33). Once again, the only logical conclusion from such verses is that God purifies whom He wills through the Prophet Muḥammad’s act of purifying the Believers. Thus, Muḥammad is the intercessor, the means of approach (wasīlah) and wasīṭah between God and the Believers. Between Himself and them [his creatures], He placed one of their own species, clothing him in His own attributes of compassion and mercy. And you [Muḥammad] did not throw when you threw, but it was God who threw in order that He may test the Believers with a beautiful trial. On one hand, Muḥammad’s act of throwing the stones is affirmed “when you threw” and then negated “you did not throw” and attributed to God “but it was God who threw.” Thus, it is God who “threw” the stones through Muḥammad’s act of throwing the stones. Once again, this verse shows how God Himself acts by means of the act of Muḥammad. In Qur’ān 48:10 – referring to the Believer’s placing their hands under the Prophet Muḥammad’s hands in the act of bay‘ah, the Qur’ān states that “the Hand of God is upon their hands.” This is significant because in physical terms, it was the Prophet Muḥammad’s hand which was placed upon the hands of the Believers. But the Qur’ān attributed to entire affair to God. 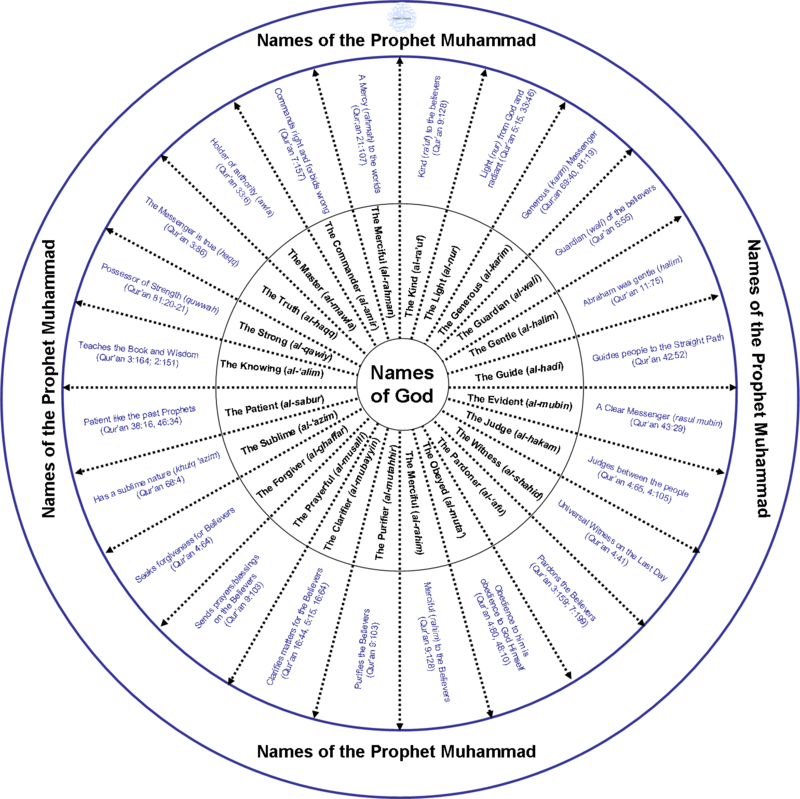 Thus, the Prophet Muḥammad is the instrument or intermediary through which God acts toward the Believers and also, in his own person, the highest reflection or manifestation of God’s Names and Attributes. This may seem contradictory at first – since the Prophet Muḥammad is a creature and servant (‘abd) of God. However, true and complete servitude (‘ibadah) before God implies the effacement of all individual egotism and impurity. Such a soul – which is completed effaced and humble before its Lord – becomes like a shiny and polished mirror in which God’s Attributes shine and are reflected. In this respect, the Prophet Muḥammad is simultaneously the humblest servant of God and the highest locus of manifestation (maẓhar) or reflector of God’s Names and Attributes. This also makes Muḥammad the best of all created beings and the intercessor and mediator par excellence between God and His creatures. God is al-Muḥyī (The Giver of Life) and the Prophet Muḥammad summons the Believers to that which gives them life (8:24). God recites His Signs (2:252; 3:108) and the Prophet Muḥammad recites His Signs (2:151). All of the above spiritual functions go far beyond the Prophet’s function of reciting and proclaiming the Qur’ān. In fact, these spiritual functions listed above fall under the category of walāyah (spiritual guardianship) and not that of legislative prophecy (nubuwwah) – which is only concerned with proclaiming the revelation. Simply focusing on a handful of the above spiritual functions of Muḥammad shows the need for a spiritual heir and successor to the Prophet. If Muḥammad was responsible for guiding the Believers on behalf of God, praying for the Believer’s forgiveness (4:64), taking offerings from them to purify them (9:102-104) on God’s behalf, sending blessings upon them for their tranquility (9:103), judging between them (4:65), and accepting their obedience on behalf of God – all during his own time, does this not necessitate the presence of someone to perform these spiritual functions for the Believers in every age and time after the departure of the Prophet? If the answer is negative, then doesn’t this contradict the very justice of God? Why would God bless the people of one particular time and age with a person who performs all of the above functions and then deprive the countless number of human beings who live after him of the same blessing? The only logical conclusion is that a person like the Prophet Muḥammad must always be present in the world to continue his spiritual and religious mission. The status of Muḥammad as the Seal of the Prophets only signifies the conclusion of scriptural revelation and legislative prophecy. But Divine inspiration (ta’yīd) and spiritual guardianship (walāyah) must always continue – otherwise, humanity would be wholly deprived of Divine guidance. Thus, the successor of Muḥammad with respect to divine inspiration (ta’yīd) and the functions of walāyah – the person who continues to guide the Believers on God’s behalf, to pray for their forgiveness, to accept their offerings and purify them on God’s behalf, to send blessings upon them, to judge between them, and accept their obedience on behalf of God – is the hereditary Ismā‘īlī Imām from the progeny or Ahl al-Bayt of the Muḥammad. There must also exist, by divine right, a continuation of at least a portion of the original link between man and God, much as it was when the prophet still lived. In other words, the world at all times must have a prophetically inspired person who, as the heir of the prophet himself, carries on the principle of his rule in all those matters where his authority was once supreme… In the current historical era, this person is the Imām and he is of necessity a direct lineal descendant of Muḥammad through his single, chosen heir and executor, ‘Alī ibn Abī Ṭālib. it is really great and gain a lot in my knowledge. How profound. It has filled my heart with light. Great article,with beautiful insight into ismaili belief and the necessity of divine guidance at all times,the only thing I would add to this beautifully written and well researched article is at no time in the history of religion no divine entity,Allah,god Bhagwan whatever name you call has said this words,This day I have perfected for you your religion and completed my favour upon you and approved for you Islam as religion”this logically explains the continious guidance till the day of judgement which was not in the past before Imamat as messenger appeared years after the last one to take there place,and this also explains Allahs warning to Hazrat Nabi(sas) that if you don’t convey this message it is as if you conveyed nothing,this also explains the 7th day Allah sat on the throne”after this humanity would not need any more messages from Allah and hence prophet mohammed(sas) was Allahs last prophet,and the time for continious guidance without any interruption till the day of judgement began with our first imam Hazrat Ali(sas). your opening statement about the ‘ahl al-quran’ is unfair. Although we do restrict our source of knowledge to the Quran, we most certainly do not relegate the Prophet to be a mouthpiece. His application of the Quran is also conveyed by Allah. That said, your exposition was very deep, thank you. I wish someday all these can be translated in to other language for the people like me who cannot understand english well.for more better underatanding.